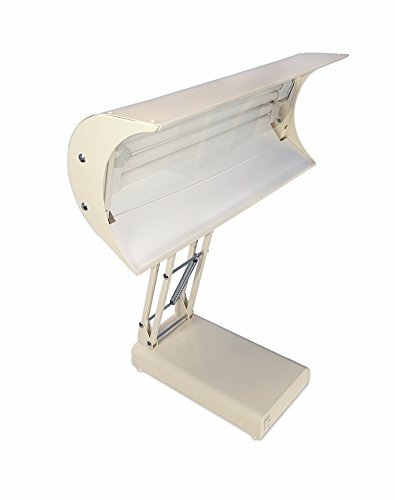 The Original Northern Light Desk Lamp delivers bright light by combining high-output fluorescent tubes with a large high-performance parabolic reflector. This results in a highly efficient unit that draws only 85 watts, yet delivers 10,000 lux. The power in our unit is channelled into light, not heat. The lamp height and angle adjustments allow you to obtain maximum comfort while enjoying the Northern Light Desk Lamp. Additionally, our large reflector provides diffuse bright light without losing intensity rapidly as you move away from the lamp. The Northern Light Desk Lamp is ideal for bright light therapy but may also be used at the office, as a reading light or for any task that requires bright lighting. 7 year unlimited warranty. If you have any questions about this product by Northern Light Technologies, contact us by completing and submitting the form below. If you are looking for a specif part number, please include it with your message.